Новости сайта: в разделе Рахманинов размещена книга С. Бертенсона и Дж. Лейды «Сергей Рахманинов. Жизнь в музыке» PDF - Новости - Музей-усадьба С.В. Рахманинова "Ивановка"
Bertensson S., Leyda J. Sergei Rachmaninoff: A Lifetime in Music. Bloomington: Indiana University Press, 2001. Reprint. Originally published: New York: New York University Press, 1956. 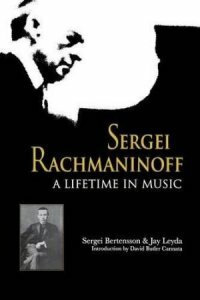 464 p.
Sergei Rachmaninoff A Lifetime in Music Sergei Bertensson and Jay Leyda, with the assistance of Sophia Satina With a new introduction by David Butler Cannata An indispensable and captivating document, now back in print! Throughout his career as composer, conductor, and pianist, Sergei Rachmaninoff (1873-1943) was an intensely private individual. When Bertensson and Leyda s 1956 biography appeared, it lifted the veil of secrecy from several areas of Rachmaninoff s life, especially concerning the genesis of his compositions and how their critical reception affected him. The authors consulted a number of people who knew Rachmaninoff, who worked with him, and who corresponded with him. Even with the availabilty of such sources and full access to the Rachmaninoff Archive at the Library of Congress, Bertensson, Leyda, and were tireless in their pursuit of privately held documents, particularly correspondence. The wonderfully engaging product of their labors masterfully incorporates primary materials into the narrative. Almost half a century after it first appeared, this volume remains essential reading. Sergei Bertensson, who knew Rachmaninoff, published other works on music and film, often with a documentary emphasis. Jay Leyda wrote extensively on Russian music and film, as well as on American literature. David Butler Cannata is Professor of Music at Boyer College of Music, Temple University. Sophia Satina was Rachmaninoff s sister-in-law and cousin.